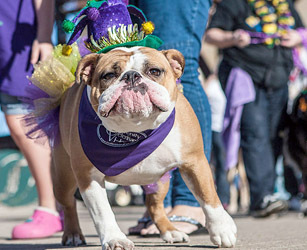 MUTTI GRAS pet parade and beauty pageant draws dogs of all shapes and sizes on Sat., April 12 beginning at noon. UPDATE: The Original Farmers Market has just notified us that due to inclement weather, their Mutti Gras pet parade and beauty pageant will now be scheduled on Sat., April 12. It will feature costumed pets competing in several categories to be King & Queen. The rest of the Mardi Gras celebration will continue as scheduled on Sat., March 1, Sun., March 2 and Tues., March 4. Join in the fun at a three- day Mardi Gras party or mark St. Patrick’s Day with a green beer at the Farmers Market at 3rd and Fairfax. The Mardi Gras celebration kicks off on Sat., March 1. In addition to a parade band that leads revelers through the Market, musical guests will include Bluecat Express, Jimbo Ross & The Bodacious Bayou Boogie Band and Eddie Baytos & The Nervis Bros.
On Sun., March 2, bands include the Zydeco Mudbugs, Floyd and The Flyboys, Lisa Haley & The Zydekats and T-Lou & His Super Hot Zydeco Band. Eddie Baytos & The Nervis Bros. return for a Fat Tuesday performance on March 4 from 6:30 to 9:30 p.m.
Face-painting and a crown decorating workshop will keep the youngsters entertained. The Market will celebrate St. Patrick’s Day, Mon., March 17 with Irish food from Magee’s Kitchen, plenty of beer and ale and a strolling piper. Parking is free for two-hours with merchant validation. For more information, go to www.farmersmarketla.com or call 323-933-9211.